S'il vous plaît réalisez que vous venez à un endroit très éloigné. Il y a des moments où il n'y aura pas de puissance, pas d'eau ou de communications. Cela arrive juste ici. Nous ne sommes pas responsables de cela et n'offrirons pas de remboursement. This was the perfect base for a week of hiking in Big Bend National Park. The cabin was comfortable, clean, and just an all around nice place! We loved relaxing on the front porch in the evenings, the stars were beautiful. Karen was great, always replying to any questions we had and making sure we had what we needed. We would definitely stay here again if ever back in the area! Thanks for the review. It was nice meeting y'all. Karen’s place was great! Very clean and perfect! Had a great time. Everything was clean and there were plenty of electrical outlets! Plenty of linens for the bath. Would be nice if there were a kitchen sink but we were able to clean our dishes in the bathroom. Parking was great, right outside of the door. Would be nice if there was drinking glasses. And with 2 women traveling we would have liked to had a deadbolt on the door. Thanks for the review . There were glasses in the buffet. I will add a security chain as you suggested. We greatly enjoyed our time in Bee Cabin #2. It was just the right size for our first trip to Terlingua and Big Bend National Park. All we needed in the morning was the coffee pot. The porch was a great spot for watching the sun come up and sipping coffee. We will definitely try to stay there again. 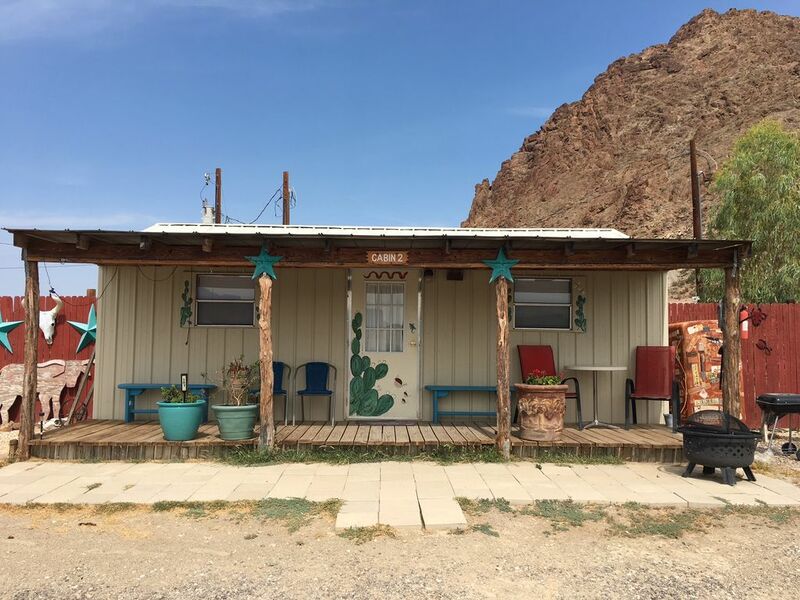 In case you have never been to Terlingua, let me give you the rundown. There is almost NOTHING out here. That's why you come. To take in the ruralness in all of its uninhabited glory. That being said, almost all lodging is some sort of manufactured dwelling that got delivered to some seemingly random place off the road and now people live in there. From that perspective, this is no different. Its 150 ft from the highway, directly adjacent to a tiny hardware store. Not that exciting, until you recognize that the entire town is surrounded by incredible views, so it doesn't really matter "where" you stay. Here is where Karen's place excels. Its clean, its cute, its convienent, cozy and doesn't cost too much. So it's got all the C's going for it. Although there is no oven or range, there is a toaster oven and a full-size fridge - as well as a water cooler. (You drink a LOT of water in Big Bend) . Two space heaters, A/C tons of extra high quality blankets and towels made the difference. As long as your expectations are realistic for the area, you won't be disappointed. The warmth and hospitality is felt in this little dwelling and each and every item in it was well thought out and appreciated. I would recommend this place to a friend whom needs to sleep 3 or less and plans to make light breakfast, lunch here, but eat out for dinner. (there are 5, yes 5 total restaurants in the "area"). Perfect for us, two seniors. Very clean and quiet. Nothing fancy. Owner very helpful and responded quickly to my questions. We would definitely stay here again.